From the Outer Banks we headed to Newport News Virginia. Why? 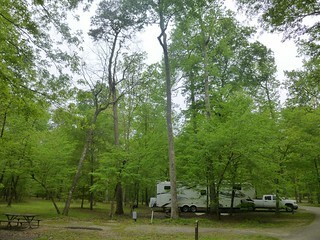 Well, there is a campground (I think it is city owned) that had pretty good priced camping (electric and water) and it was only a short drive to Williamsburg, Yorktown and Jamestown which were high on our list of places to visit. So after dropping off the mini fridge at the scrap yard we continued north over/under the Hampton Roads Bridge-Tunnel and showed up at an amazingly wooded park just on the edge of Newport News proper. We had called a week or so in advance to make reservations but they said there was no need….and they were right, we had our pick of many awesome sites. We chose site 96 as it was well positioned between the playground and the bath house. A bunch of cub scouts and their families were camping in a nearby group site so our kids had fun playing with the wad of kids over at the playground before dinner. As told by Brielle, typed by Steph, and Steph adds explanation or additional info inside the parentheses. 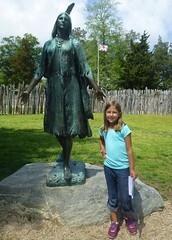 We went to Jamestown in Virginia. 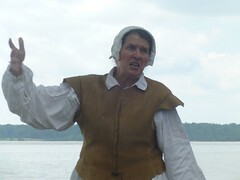 Jamestown is a place that you can meet up with a Chicken Lady. She is a normal lady dressed up as a slave. (She was actually acting as an indentured servant. They are people that couldn’t pay their way over here to the new colony, so they work off their travel debt for a master here in Virginia.) She was the poultrice for her master. She was holding a chicken. 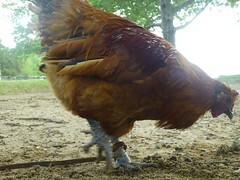 The chicken wanders around when she sets him down. You might want to go on one of her tours. At the end we got to pet the chicken. We saw him eat a caterpillar and a queen ant. The chicken lady told us they (the first settlers) had no clear water. She talked about it (the James River) was deep enough they didn’t have to park their boat in the middle of the river. We learned about Pocahontas. She was a real Indian, she was really real!!! I thought she was just made up, but she wasn’t. 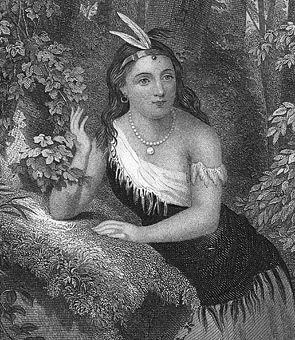 She was an Indian princess (she was the daughter of the King of the Powhatan Indians.) She saved an English’s life two times. Before she got married she got captured by the English. She got married to an englishman when she was only 19. 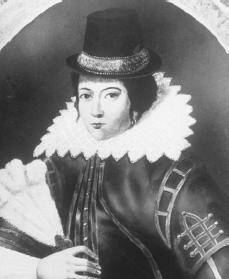 The guy that she got married to was John Rolfe. When she got married she had a son named Thomas. She died when she was only 22. She got buried in England. I found a green caterpillar. It’s name was Apple because it was green as an apple with a bit of yellow. I didn’t want to leave it, but I had to because it wanted to go on a leaf because it needed food. Caden convinced me to do that. 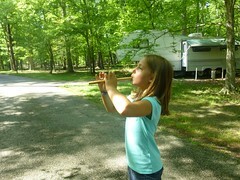 At the end I got a wood recorder that was only $1.90! Good day. I’m gonna start off by telling you to try to read the rest of this thing in a British accent. I’ll be doing my best to write this in Olde Englisheyness. I am really excited to tell you that I am searching for a trade to begin work with. I have so many options. 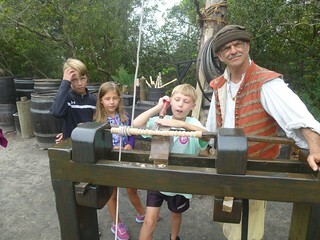 I can be a cooper, tinner, blacksmith, silversmith, shoemaker, weaver, cabinet maker, tailor, caster, candle maker, printer, gunsmith, woodworker, butcher, or baker. We value experiences and relationships more than we do stuff. But stuff still has a way of keeping you tied down. So part of the idea of this adventure, at least in my mind, was to force ourselves away from our stuff and replace it with those things we value more. 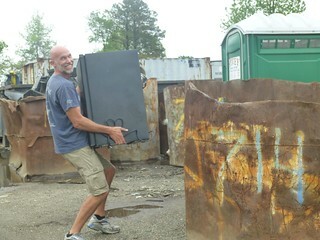 When you live in tight quarters there is not much room for physical stuff. Even if we had the space, we are filling our days with exploring the outdoors, nature, history and science that we don’t have time to futz with physical stuff. Yet somehow we still have too much stuff and so something’s got to go.